Remember when almost every single post I did here on The Perfect Palette was an inspiration board? Well, I swear I haven't abandoned my love for them! I'm admittedly still very obsessed with making them. And creating inspiration boards is still one of my all time favorite things to do! Especially when I can help out a bride-to-be in the process! Amanda, this board is for you! You said you were hoping to incorporate yellow into your wedding, but you wanted it to still feel sweet and charming and not overly modern. You also wanted something that would fit your Southern chapel wedding. So off to the drawing board I went and here is what I came up with! I'm really, really liking the whole feel of it. It's sweet, romantic, and perfectly cheery! And without all of the modern styling that you typically see in yellow weddings. 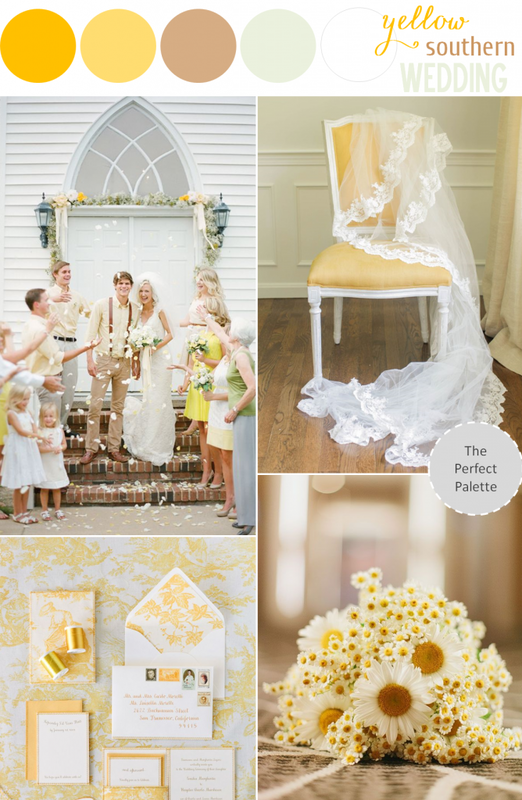 I like the idea of daisies and soft pale yellow shades mixed in with slightly darker yellow shades! Oh, and I can't go without mentioning this gorgeous invitation suite! It's a perfectly charming look if you ask me! 13 Comments " Sunny Southern Wedding: Yellow Styling Ideas "
I love how you included daisies and the invitation suite with the patterned lining on the envelope is a darling touch! Definitely not an overly done palette. This is pretty much perfect! Ooh, love it! So sweet and charming! This makes me smile - love it! Definitely not an overly done palette. This is pretty much perfect!and i hope you will like this tungsten carbide bands,they are just for you!! yeah it's great! !Love the yellow toile stationery!and i hope you will like this tungsten carbide band,they are just for you!! This makes me smile - love it!,and i hope you will like this tungsten carbide band,they are just for you!! love the mix of buttery and golden yellow hues! I love the really soft, grey-green color. What do you call that?